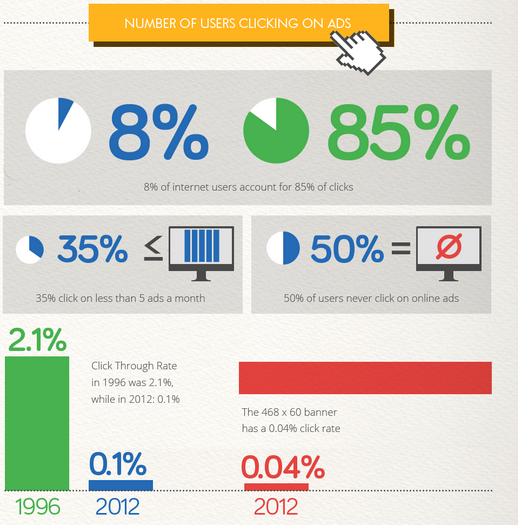 Only half of users ever click on online ads, while 35% click on less than five ads per month. Among online ad viewers, 75% saw the ad on their computer, while the remainder viewed the ad on their phone or tablet. View more documents from Sumit Roy. The importance given to the CTR .. is primarily due to " the fact that apart from the CTR model, there has been no unamity on just " how to judge the metrics" of an online ads . While the CPM model ensured that " advertisers bombard users with their banners ...the CPC model recognized that a click leads to a action which may or may not convert. A high CTR rate does not guarantee a high conversion .. which means that "even a click to the landing page of the advertisers which does not convert is actually wasted clicks which is again equal to users not clicking at all . 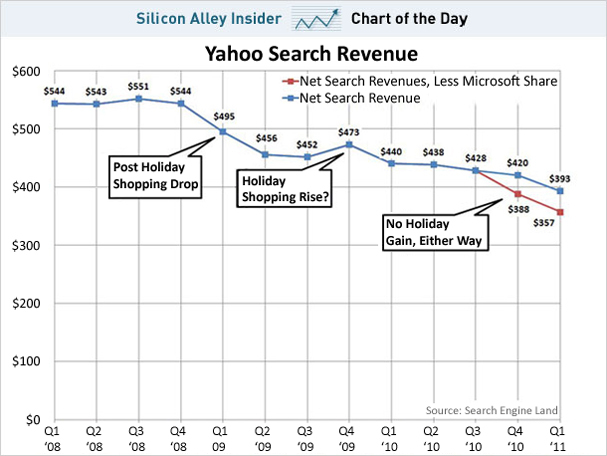 However the fact of the matter is that the CTR ( click through rates ) has been in decline for years. As many recognize the importance of other measures in determining the success of online campaigns in attempts to capture the branding as well as the direct-response effects of advertisements, fewer and fewer web users were clicking on fewer and fewer ads. The study also provides further evidence to back up brand marketers who want to measure more than just clicks to determine the effects of their campaigns. 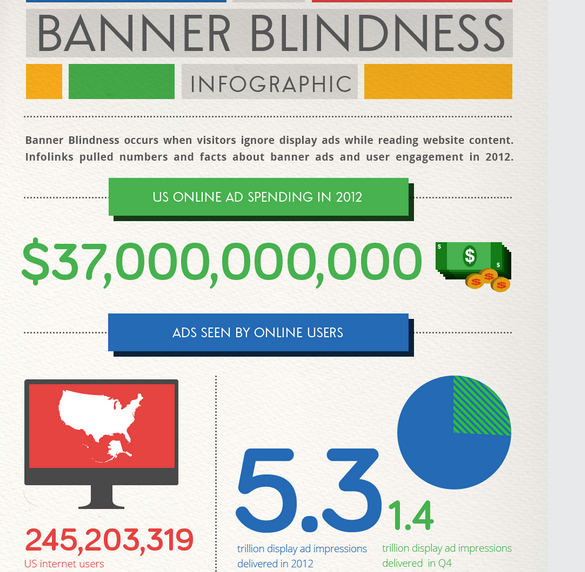 Just 20.4% of conversions came after clicking on a banner ad. Instead, the vast majority happened among web users who had seen the ad but not clicked on it, and who converted at a later date. The new findings are an encouraging sign for advertisers,” said Gal Trifon, CEO and co-founder at MediaMind, in a statement. “Although CTR is only a partial measure of online success, the leveling of CTR shows that online advertising has reached a level of maturity and that advertisers have become more sophisticated in luring users’ interest. 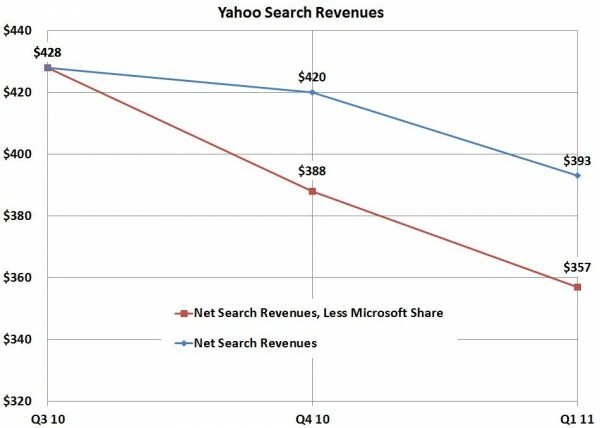 Display advertising still battling » Adotas: "Total measured advertising expenditures in the opening quarter of 2009 plunged 14.2 percent versus a year ago, to $30.18 billion, according to TNS Media Intelligence. 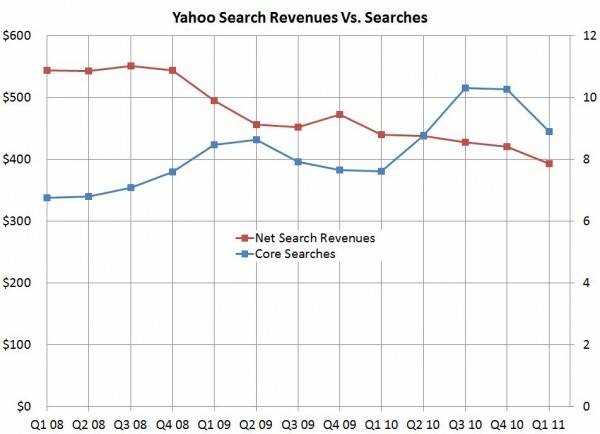 This follows a 9.2 percent decline in Q4 2008 as the advertising recession accelerated in the new year. But, according to TNS, Internet display expenditures grew 8.2 percent as telecom, travel and local retail advertisers expanded their online marketing programs. “The ad market declined significantly in the first quarter, overtaken by a collapsing economy which prompted consumers and marketers alike to shut their wallets and conserve,” Jon Swallen, SVP Research at TNS Media Intelligence, said in a statement. “While there are hopeful signs of general economic indicators bottoming out, the advertising sector still appears to be lagging behind. Available data from second quarter shows ad expenditures tracking on a comparable plane to recent months"